"My affinity and passion for music seemed to always have existed. A dream come true, I carried my first flute home with me on that first day mesmerized by its possibilities and determined to make them realities. I grew up listening to the virtuosic solos in Tchaikovsky, Prokofiev, and Beethoven. The opportunities to recreate these magical sounds and work with other great musicians became the most exhilarating moments of my life. I was convinced that this was my destiny. As a dedicated musical artist, I commit myself to the sincerest interpretations and most enthusiastic performances, which foster unique treasures in time and express emotions deeper than words could ever depict. Throughout my years as a performer, I have simultaneously cultivated my teaching skills. I realized that teaching was just as necessary an avenue to express my art as was the stage. Eager students have continually stimulated my passion for teaching. 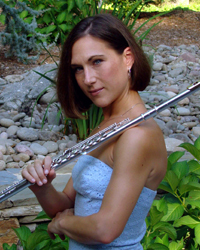 They seek my personalized approaches, which combine original methods with the methods from my flute heritage. By helping students discover the raw talents embedded within themselves and then shaping it into their own voices, I constantly adapt my teaching to serve the student best. To see a student accept and nurture the seeds of advice into maturity is the greatest reward for any teacher. Student successes arrive in many forms, just as the same seeds may sprout into different, yet equally beautiful blooms."